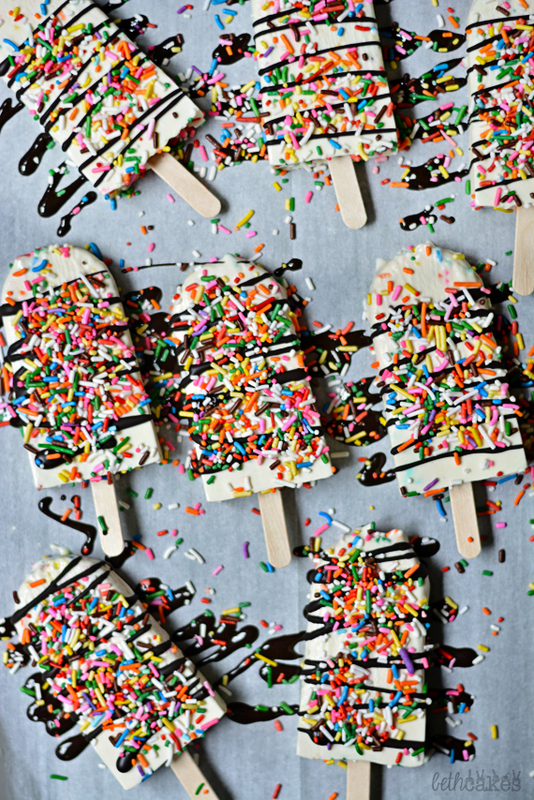 These popsicles are totally perfect for Friday. Especially because they are SUPER easy to make. There are only a few ingredients and they taste like buttery yellow cake. These pops remind me of these yogurt cups I used to eat when I was little that had a pouch of sprinkles in the lid. That stuff was the bomb, but it was probably high in sugar or something (which is why I probably liked it) because my mom didn’t buy it that often. So it was sort of like a treat every once in awhile. I used to eat yogurt for breakfast a lot when I was in college because it was easy and fast, but my problem with week day breakfasts is that I eat the same thing for a long time. Weeks and weeks. And then I get sick of it. I’ve just gotten back into eating yogurt for breakfast or snacks, and I decided I needed to revamp some pops I made on my old blog. When I made the previous popsicles, I don’t think I really knew what I was doing. Sometimes I look back at old stuff I made and don’t remember why I chose certain ingredients over others. Soo, these pops needed a major makeover. 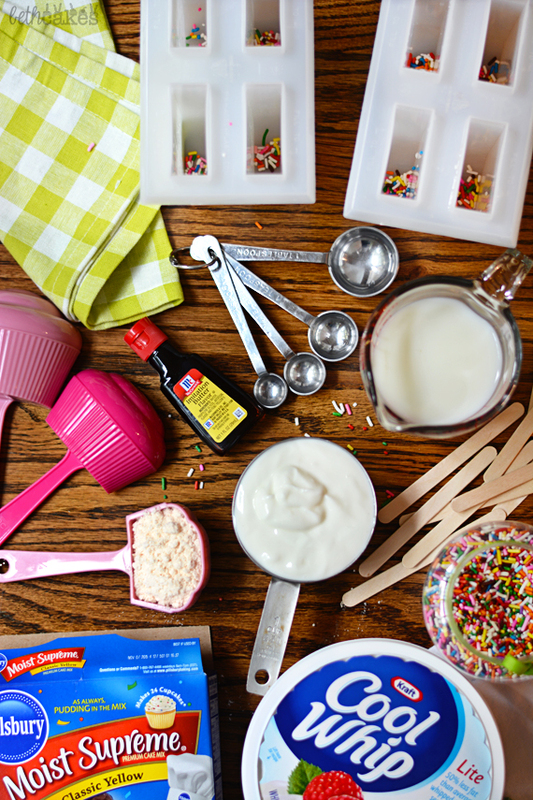 Combine yogurt and cake mix in a bowl and whisk until completely combined. Add milk and butter extract and carefully whisk together. Fold in Cool Whip and sprinkles. Fill the popsicle mold and freeze for about 4 hours, or overnight. Dip mold in hot water for 10 seconds to release pops. In a double boiler over medium heat, combine chocolate chips and cream. Stir constantly until completely melted and combined. Let the ganache cool, transfer to a squeeze bottle, or just drizzle it over the pops. 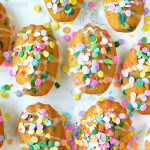 I currently don’t have any posts scheduled for next week (because I’ll be at Food Blog Forum !!! ), but I’ll probably be taking tons of photos. So make sure you’re following me on Instagram! Absolutely obsessed with these. Cutest pops ever!! So perfect for Friday!! so pretty!! 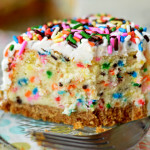 love the funfetti! 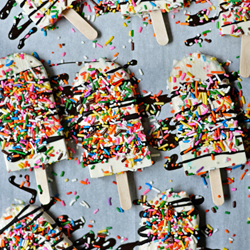 Of course you will make the BEST pops of the summer with sprinkles AND cake!! Love these!! Yummy to eat and beautiful to look at! These are so fun!! I would be a hero here if I made these for my boys. Love ’em! Love these photos, Beth, they’re so bright and colourful! 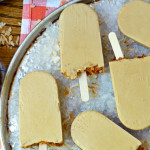 I haven’t made any popsicles yet this summer and I definitely need to change that. Have fun next week! Waaaaaaaat. There is a thing called butter extract!?!? What an insanely beautiful!! I love Funfetti Yogurt Pops. 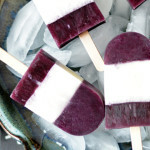 These yogurt pops are so pretty and adorable, Beth! I love how fun and colorful the photos are too! Love them! And I’ll see you tomorrow!! Yay! These pops look crazy insane! My eyes go everywhere with all the colors, sprinkles and drizzle. Very pretty! pinned! First of all, your measuring cups are just to die for! So cute!! 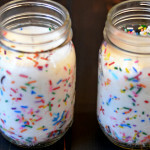 Second of all I am loving all the sprinkles up in here! This look fun, fun, fun! Straight up stealing this recipe. Seriously, these are too much! WOW! What pretty pretty popsicles! 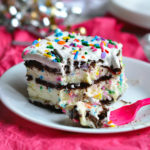 I would never have thought to use a cake mix… delicious! These are pretty wild lookin’ pops. Lots of fun for kids small and ‘big’. Oh wow Beth, these are the prettiest popsicles I’ve ever seen! 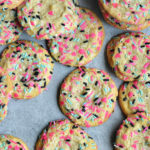 Sprinkles just make everything better, right? 😀 What an amazing dessert to enjoy while the summer winds down! Fun! 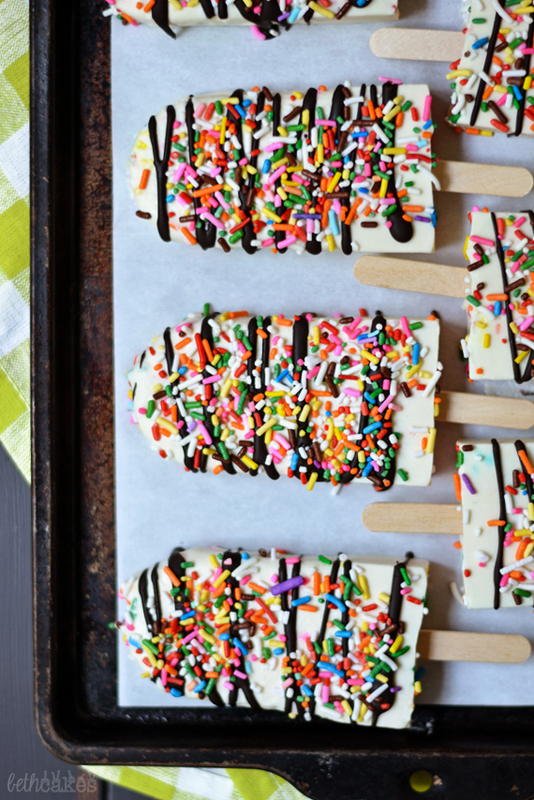 This is exactly what my popsicles have been missing–sprinkles and cake flavor! Love it! Beth these are beautiful! They would be an amazing breakfast or dessert, and I love the idea of using cake mix for flavor. Brilliant! I hope you had a wonderful time at the conference! 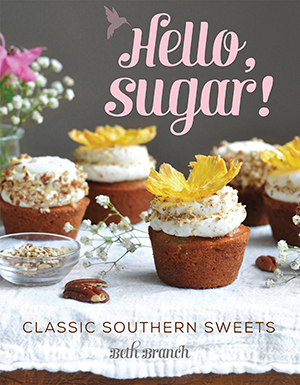 These look fabulous, Beth! They’re so colorful and I love the way you plated them. I want one right now.